She has been repeating this for a while now. I can relate to the expression. Life is not all black and white. Foreseeing your moves is sometimes not so easy. It is not a game of chess that we are playing. There can be unexpected incidents. Making the right decisions, coming to the right conclusions is not always clear cut. So, yes, the sinner should not be blamed. She keeps saying it over and over again. It is getting weary. The more she says it, the less meaningful the sentence is getting, like those words kids repeat over and over until words are dissected and turned into unconnected sounds. She said it once more. Is she trying to convince herself by mumbling it endlessly? I can tell she is having difficulty coming to terms with “it”. She is playing with the strap of her purse, twirling it between her fingers, with the shadows of doubt passing through her eyes. If I were not sitting so close to her, I would have thought she was desperately praying with a rosary in her hand. There she goes again. She looks out through the window once in a while. She has these really sad eyes. They seem a bit moist, similar to those of a sad little puppy. She seems to be in need of something, but would never utter a word to ask for it, like a well trained pet. And again… Her meek voice is so annoying. I cannot think anymore. The expectation to hear the same words once again… Knowing that she will not stop until we get to the last stop, that she will carry on, in the same manner… It is so irritating. Not again! This reminds me of that ancient torture where they tie you up motionless and drip icy water on your head one drop at a time. You get to a point where you think they are cutting your head open. That is exactly how I am feeling right now. Oh God, please not again! And she did it! How long is this road? How far is this stop?! I cannot take it anymore. I am trapped here, in the middle of nowhere! I need to get out of here. I cannot take this woman anymore. She is suffocating me! No! How can I shut her up? Is there no way of stopping her? Is there no way I can put an end to this?… She is about to say it again, she has turned towards me… Her lips are moving, she is going to say it! “We shouldn’t have done it! We shouldn’t have! We just took part in the killing of a live being! I want to believe it was a moment of weakness, but how can I live with myself? How can you live with this guilt? We have murdered God’s creation! 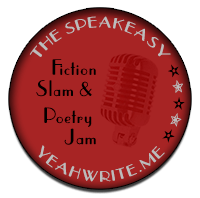 Word Count: 639 The Speakeasy prompt for this week (#149) is to use “Don’t blame the sinner.” as the first line. I had fun constructing a piece at the below address word for word. It starts with a simple sentence and by adding words wherever you like, you literally get to unfold a story. It is a good writing challenge and an excellent exercise for wordholic brains. I have met many people on my way, some were old some were young, some were slow, some were fast, but I have never spent enough time at one place to make real friends, to share a drink, a moment that could last forever, a moment immortalized like a painting in memory. I have felt closer to some, though, and more distant from others. I have had some children, here and there but never stayed behind to watch them survive. I could not have stayed… I had a tail of darkness to chase… a world of wonders to figure out. Did I wish I could stay?… I am not sure… This life of wandering, hours, days, weeks of wandering, hoping to find out what life had in store for me consumed me, made me restless… I believed I could figure it all out only if I kept on, and saw what was hidden in the dark. I had no one to ask about my past, to direct my questions… I never knew my mother or father… I never knew where they had met, how they had decided to conceive me… Probably they had acted on an impulse, a raw urge to copulate rather than a thoroughly designed plan for the future. Much like the way I came to be a parent, I assume. Probably, they did not brood much over it, and followed their instincts, their inner drive to be close to someone, to feel fluid with another. Without even bothering to look at the snail and its philosophical quest he had just obliterated under his foot, the man walked on counting the money he had earned gambling. The first line of this week’s Speakeasy challenege was to write a piece of fiction of 750 words or less starting with “I have spent years chasing the tail of my darkness.” and making a reference to Paul Cezanne’s painting the Card Players.